With an action-packed storyline, this very original, funny script makes for panto at its best! Including heaps of side-splitting humour, solid character parts and keeping the Chorus involved throughout, this sparkling new version is guaranteed to banish boredom … in your audience and cast alike! This fun-filled script is packed with novel ideas and comedy business, whilst remaining faithful to the well-known story. Abundant audience participation, visual comedy and traditional pantomime antics are also included, together with two particularly havoc-prone Broker’s Men, Snatchet and Scarper. There is also a good opportunity for an unusual, show-stopping ultra-violet scene (optional) as the magic begins to work in the garden. The scenery can be fairly straight-forward, but there’s lots of scope for some spectacular staging for a more ambitious production! Many productions of this script have won NODA and drama federation awards, including The Bolsover Drama Group and Little Hallingbury Panto Group (both of whom won NODA “Best Pantomime”)! Fee fi fo fum, it’s so good to have Rancid under my thumb. (Calling him:) Rancid! (Running on SL) Yes, your enormousness? Did you check my Twitter feed for me? Yes, but there’s just another senseless tweet from some loony who doesn’t know what he’s talking about. I’m hungry! Is it dinner time yet? Then bring me a snack – I fancy one of those things on a stick. (Looking into the audience) Well, I just happen to know where I can find plenty of those! And is there any wholefood in? How does a whole cow and a whole apple Charlotte sound, your humongousness? Hmm – I suppose that will do, as long as I get plenty of appetisers first. Oh, I don’t think we can run to that. Money’s a bit tight now … thanks to Brexit! Nonsense! Bring me a bucket of houmous and a vat of sweet chilli sauce! Oh, no – looks like we’re in for a “double dip” recession! How do you like your beef served, your massiveness? Oh, just cut its horns off and wipe its bum! And after that, I’m off out. Out? Where to, your ginormousness? (He cowers away from the large club, or holds one up from somewhere on the set if the Giant doesn’t have one.) Oh, I see what you mean! But first, a glass of wine, some music from my harp and a song from the Princess. DANCERS: Featured in musical numbers as desired. Also perform the optional ultra-violet scene. "...First thing’s first. You need a good script. And you chose well with Alan Frayn’s script. There were gags-a-plenty, which kept the audience giggling and tee-heeing throughout, with regular guffaws thrown in for good measure! All the ingredients of a good panto were there." 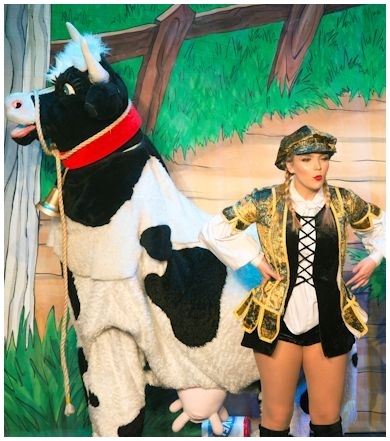 "...Jack and the Beanstalk has been fantastic! The script is really funny with laugh after laugh all performance long. You really know your stuff when it comes to writing panto! It really is very traditional but also up to date. The UV scene is spectacular – thanks for all your help and advice. Our reputation has been really enhanced by doing your version." "...A lively modern script by Midlands writer Alan P Frayn gave many a topical twist to this most traditional of pantomimes, which played to ten packed houses. It was the (beans) talk of the town! The audience left with smiles on their faces and warm comments."